The Deploy a VHD Step was introduced in Octopus 3.11.1. The Deploy a VHD Step requires the target Machine to be running Windows Server 2012 or newer, and the Tentacle service to have Administrator privileges. 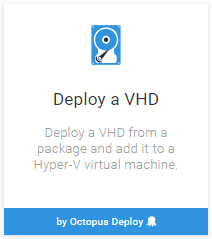 Octopus Deploy has built-in support for deploying Virtual Hard Drives. The feature allows you to deploy a package containing a VHD while taking advantage of Octopus features such as variable substitution in configuration files or running config transforms on files within the VHD. Octopus can then optionally attach the VHD to an existing Hyper-V virtual machine. To deploy a Virtual Hard Drive, add a Deploy a VHD step. 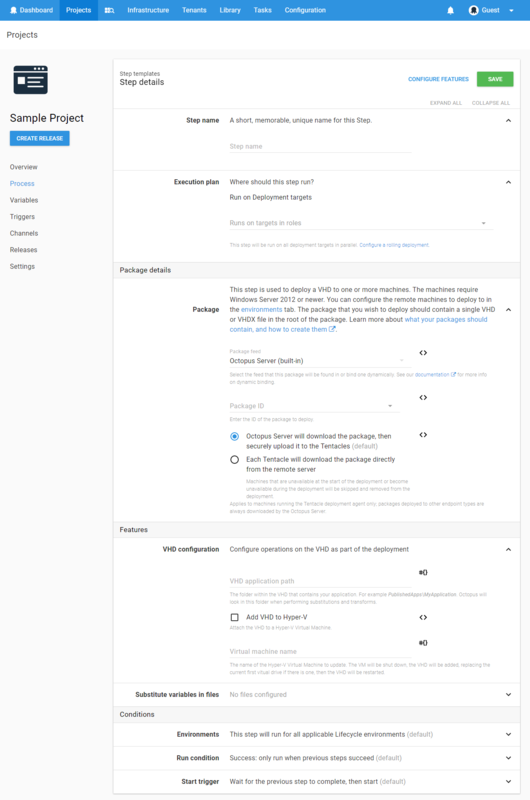 For information about adding a step to the deployment process, see the add step section. Use the Package Feed and Package ID fields to select the package containing the Virtual Hard Drive (*.vhd or *.vhdx) to be installed. There must be a single VHD in the root of the package. The package may contain deployment scripts and other artifacts required by those scripts, but only a single VHD. Add VHD to Hyper-V Attach the VHD to an existing Hyper-V virtual machine. Octopus will shutdown the virtual machine, add the VHD (replacing the current first virtual drive if there is one) then restart the virtual machine. Virtual Machine Name The name of the virtual machine to add the VHD to. The package is extracted to a newly created folder. The VHD from the package is mounted. The mount point is available in deploy scripts using the OctopusVhdMountPoint variable (for example $OctopusVhdMountPoint in PowerShell). Any PreDeploy scripts in your package are run. Enabled step features such as configuration variables in JSON files, config transforms and substituting variables in files are run against the package folder and the application path within the mounted VHD. If enabled, the VHD is attached to a Hyper-V virtual machine. The step waits for the virtual machine to reboot, so you should be able to interact with the running virtual machine in your PostDeploy scripts. If you have a VHD with multiple partitions, in step 2 above all partitions are mounted, and the mount-points are available to your scripts in OctopusVhdMountPoint_0, OctopusVhdMountPoint_1, etc. The OctopusVhdMountPoint variable will contain the mount-point of the first partition that was actually mounted (see below to not mount all partitions). To change the behavior when there are multiple partitions create Octopus Variables against your project indexed to the partition (starting at 0). If you have more than one deploy VHD step you will need to scope the variables to each step.